Kansas' Brannen Greene works out in preparation for the 2016 NBA Draft in New York City. 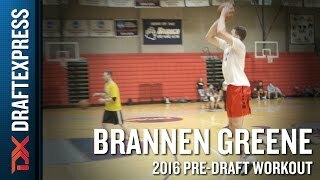 Ranking among the top-35 recruits in the high school class of 2013, Brannen Greene emerged as a valuable roleplayer for the Jayhawks a year ago averaging 5.7 points and 2.1 rebounds over 15 minutes per game. Coming off the bench behind Andrew Wiggins as a freshman and then Kelly Oubre as a sophomore, Greene has yet to carve out a major role with the Jayhawks, but his pedigree and roleplayer potential give him some intrigue. Standing 6'7 with nice length and a solid frame, Greene has good size for a wing. He's also a solid, but not spectacular athlete, being more fluid than explosive. Undergoing hip surgery which caused him to miss the World University Games, it will be interesting to see how well Greene is moving once the season starts. Offensively, Greene's role is predicated on his ability to make catch and shoot jump shots. 88% of Greene's shot attempts in the half court were jumpers a year ago, while 73% of all of his attempts were 3's. Knocking down 42% of his catch and shoot attempts, 50% of his pull-ups in a limited sample, and 40.4% of his overall 3-pointers, Greene shoots the ball with tremendous touch and consistency from the perimeter and is lights out when left open. Hunting jump shots in the half court and on the break alike, the Georgia native has outstanding mechanics and self-confidence. Playing a very one-dimensional role, Greene flashes some ability to put the ball on the floor to dribble into space, and will throw down the occasional dunk on the break, but has yet to show much ability as a shot creator and scorer inside. To his credit, he does have a nice feel for the game and is lights out from the line, two things working in his favor as his playing time and role grows. The question throughout Greene's two years in Lawrence has been when he'd get the opportunity to showcase his game. With no one-and-done small forward in this year's class, Greene figures to see more touches this season, even if he'll still be sharing minutes on the wing with Wayne Selden and Sviatoslav Mykhailiuk. It will be interesting to see if his shooting percentages from the perimeter hold up over a larger volume of attempts and just how much more Greene to his game than he's showed over the last two seasons. Defensively, Greene played with improved energy a year ago, but tended to find himself out of position defending the ball too frequently. Greene is a work in progress defensively and struggles through some lapses, but appears capable for stretches as well. It will be interesting to see if Greene can become the defender he needs to be to earn minutes for Bill Self's Jayhawks this season. One of the more efficient low-usage role-players in the Big XII a year ago, the 2015-2016 figures to be a critical one in the development of Brannen Greene. As his first real opportunity to earn significant playing time, Greene is a player to keep an eye on, as with his size and shooting prowess, a breakout year could place him firmly on the radar of NBA scouts.